The original pattern that was used to create these bonnets was from an older, period bonnet that was completely hand sewn. 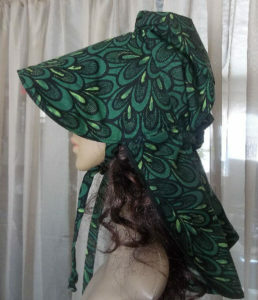 That style of bonnet had much longer neck pieces in the back and a longer brim which protected women from the sun and heat. The side panels added an additional bit of preservation for a woman's skin from not only UV rays, but even wind. Simply loosening the ties in the back of the hat allowed a women greater advantage against burning because it could be pulled further to the front of the face to shield her skin. The protective edge of this hat extends a bit further over the face than our other traditional, and more decorative ones, found here http://www.rawhidestudios.com/sunbonnets/. The actually length of it extends approximately 7 inches over the face and nose. 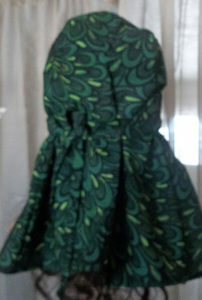 (which can be longer or shorter depending on how tight the drawstrings in the back of the neck are pulled.) 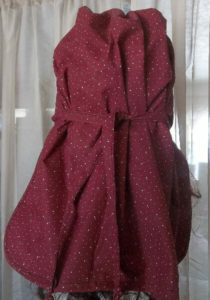 The cap and the back neck ruffle are actually one solid piece of material and it can completely cover the neck and go another 4 inches beyond. This is great sun coverage! As someone who has already had cancer removed from her face, this has great importance to me. I hate the sticky, slippery feel of sun screen and more and more am finding myself wearing hats in the garden. 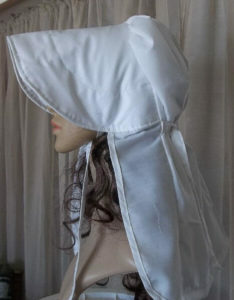 Fair skinned people like myself will easily find that bonnets like this will accommodate those concerns. At the right is a photo of the bonnet. It not only has ties underneath the chin to secure the hat, the ties on the back can be pulled tight to gather the side piece, which is attached the the cap back. It can also be loosened to make the bonnet roomier, and give even more protection from sun and wind damage. The rear view picture of the bonnet back gives an excellent view of just how long the back is as well as what great coverage it can actually give. A few of these bonnets are not only period correct in style, but also follow the established criteria for a period correct bonnet in color as well as being constructed of 100 % cotton. Bonnets made in this matter will have notations in the description. Currently there are only a few of these bonnets as it's a new style for Rawhide Gifts and Gallery to offer. More can be added in the future. Made of a rich, dark emerald green color and a cotton polyester blend, it has beautiful markings that appear to look as if it was outlining 'feathers'. NOT PERIOD CORRECT MATERIAL. All white, this bonnet reflects even more heat in the summer. But being white, it will also attract dirt. Maybe not so great for gardening, but wonderful for sitting by the lake. Made of a summer weight light cotton polyester. NOT PERIOD CORRECT MATERIAL. Drab colors really weren't the only colors used in pioneer times. Bright colors like this red were also used, especially for church, neighborhood gatherings, picnics and the like. This bonnet is 100 % cotton. Both the color and the material can be found in use during the mid 1800's. 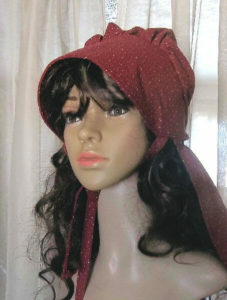 Beautifully rich burgundy colored bonnet with tiny white print. The color is period correct….but because this material is a cotton-polyester blend, the material is not. Made of actual 100 % homespun cotton, this green checked bonnet is completely period correct not only in material and color, but in the pattern style as well. If you are a re-encactor, this will work well with your group and in addition, lend authenticity. A nice light-weight cotton-polyester blend, this bonnet has tiny navy blue flowers densely scattered over a white background. The side panels have been deliberately reversed to allow for personalization such as adding a monogram or embellishing with buttons.